Jedi Mouseketeer: Sorcerer Radio's WDW Tiki Room 8/16 - D23 Expo 2013: David A. Bossert and Roy Patrick Disney "Remembering Roy E. Disney"
Sorcerer Radio's WDW Tiki Room 8/16 - D23 Expo 2013: David A. Bossert and Roy Patrick Disney "Remembering Roy E. Disney"
On this Friday's show Aljon chats with author, Producer, Creative Director and Head of Special Projects at Walt Disney Animation Studios, David A. Bossert and Roy Patrick Disney, business investor and son of Roy E. Disney, great nephew of Walt Disney. They will be discussing the new book "Remembering Roy E. Disney: Memories and Photos of a Storied Life." Bossert had a unique role at The Walt Disney Company, from 1994 until 2010 working primarily on projects that were spearheaded and executive produced by Roy E. Disney. Pre-order "Remembering Roy E. Disney: Memories and Photos of a Storied Life" Hardback Edition today! Listen for your chance to win a copy of the book on Sorcerer Radio! Dave has co-authored the Disney Animated iPad App which is available at the Apple iTunes store. 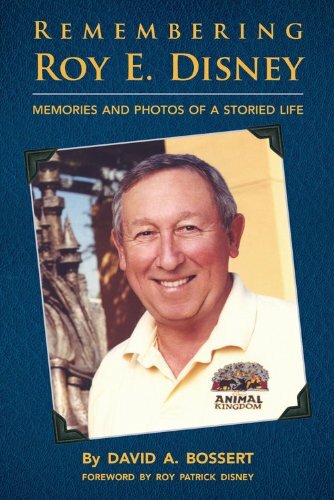 His first book, “Remembering Roy E. Disney; Memories and Photos of a Storied Life", is being published by Disney Press on September 17, 2013 and is available for pre-order at Amazon.com.